Ahead of Prime Minister Narendra Modi’s visit to Gujarat, Patel quota agitation leader Hardik Patel and 50 of his supporters on Sunday got their heads tonsured, alleging “atrocities” against their community by the Bharatiya Janata Party government, and launched a ‘march for justice’. 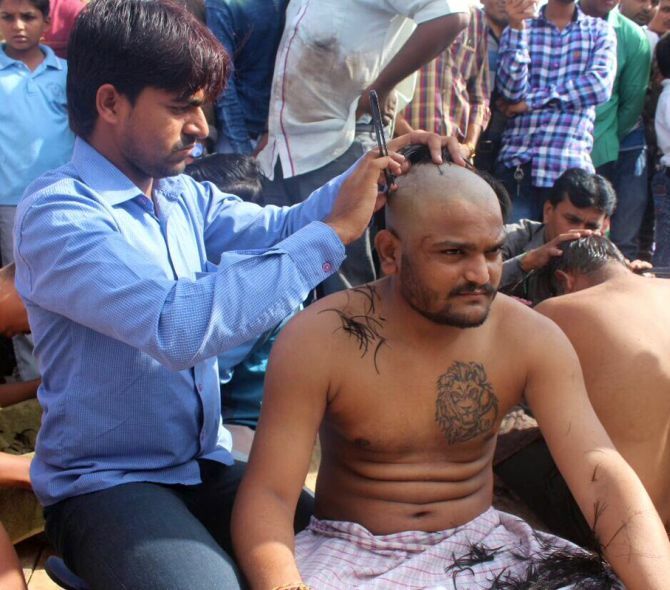 Hardik and 50 members of his Patidar Anamat Andolan Samiti got their heads shaved as a mark of protest at Lathidad village on Sunday morning. Thereafter, they embarked on ‘Nyay Yatra’ from Botad district, to highlight their demands, including inclusion in the OBC category for reservation. “Along with the 50 PAAS members, I decided to get our heads shaved to highlight the atrocities committed by this government on our community in the last two years. Now, we are embarking on the Nyay Yatra to seek justice,” Hardik told reporters. The march, which commenced from Botad, would pass through around 50 villages and end in neighbouring Bhavnagar city. A few days back, Hardik had announced restarting of the quota stir in Gujarat and said his main goal was to defeat the ruling BJP in the upcoming assembly polls. The 23-year-old quota leader had accused the state government of dilly-dallying on the issue of reservation to Patel community and warned that the ruling party would face consequences in the assembly polls if it did come up with a definitive plan on the issue at the earliest. Hardik’s move came ahead of Modi’s scheduled two-day visit to his home state from Monday. The PM is slated to attend the annual general meeting of African Development Bank and other programmes. What if it was Haider Pathan and not Hardik Patel?